The End (Almost) - Starring me, Donut! Home > Donut the Bear > The End (Almost) - Starring me, Donut! When Donut the bear is told his story is over and he has to leave, he isn't ready. After all, he hasn't had a chance to have any fun! Will Donut's sneaky schemes and elaborate disguises be enough to keep his story from ending? 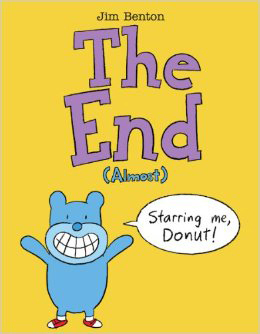 Donut's silly antics in this clever picture book from New York Times bestselling author Jim Benton are sure to delight kids who never want their favorite stories to reach The End.